본 발명은 전자파의 유도 자기장을 발생하는 송신패드 및 충전용 전자기기의 내외장형 수신용 모듈을 사용하여 핸드폰, 리모콘, MP3, PMP, PDA 및 배터리 충전이 필요한 다양한 전자기기들의 전원충전을 위하여 송신패드위에서 자유롭게 무접점ㆍ무선으로 동시에 여러 가지 전자기기들의 배터리에 전원을 충전할 수 있는 어댑터 및 송신패드로 구성된 송신모듈과, 송신모듈 및 수신모듈을 구비한 소형ㆍ경량의 무선 전력 송수신 장치에 관한 것이다. Transmitting pad invention to the power charge of the various electronic devices using my external reception module for transmitting pad and charging the electronic device for generating an induced magnetic field of the electromagnetic wave that requires mobile phone, remote control, MP3, PMP, PDA, and charge the battery above relates to the free solid state and the radio at the same time a number of configured power to the battery of the electronic device to the adapter and the transmitting pad that can charge the transmission module and the wireless power transmission and reception of a compact and light weight having a transmission module and a reception module unit . 보다 구체적으로 본 발명은 다양한 전자기기 내외장용 수신용 모듈의 사용하여 핸드폰, MP3 및 PDA등의 배터리 충전을 위하여 송신패드위에서 무접점ㆍ무선으로 충전할 수 있는 소형ㆍ경량의 무선 전력 송수신 장치에 있어서, 콘센트로부터 나오는 일반적인 교류전원을 AC 어댑터를 경유하여 수십㎑내지 수백㎑의 교류 정전압 신호로 변환한 후 높은 에너지 효율로 전력을 송신할 수 있도록 구성된 송신코일을 구비하고 전자파의 유도 자기장을 발생하는 송신패드와, 상기 송신패드에서 발생한 전자파의 유도 자기장을 수신하기 위하여 솔레노이드 혹은 스파이럴구조의 수신코일과, 수신코일을 통해서 수신된 전기 에너지를 극대화하기 위한 공진회로와, 공진회로를 거쳐서 나온 신호를 정류하는 정류 회로와, 정류된 소정 전류와 전압을 가진 전기에너지 The invention More particularly, in the wireless power transmission device of compact and light-weight that can be filled with the non-contact and radio on the transmission pads to charge the battery of the cell phone, MP3 and PDA use of my exterior reception modules various electronic devices , a transmitting coil configured after converting the common AC power supply coming from the wall outlet via the AC constant-voltage signal of several tens ㎑ to several hundred ㎑ via an AC adapter to transmit the power with high energy efficiency and transmission for generating the induced magnetic field of the electromagnetic wave and a resonance circuit in order to maximize the electrical energy received via the receiving coil and a receiving coil of a solenoid or spiral structure in order to receive the induced magnetic field of the electromagnetic wave generated in the pad, the transmitting pads for rectifying the signal out through the resonance circuit and a rectifier circuit, electric energy having a predetermined rectified current and voltage 를 충전하는 충전회로 및 보호회로로 구성된 수신모듈을 구비하고 최대 유도 수신전력 변환 및 전력 전송으로 핸드폰, 리모콘, MP3, PMP, PDA 및 충전이 필요한 다양한 전자기기의 배터리에 전원을 충전함으로써 전선의 단선 및 누전에 의한 안전사고를 예방할 수 있고 소형 ㆍ경량으로 취급이 용이하게 하는데 그 특징이 있다. To a reception module configured to a charging circuit and a protection circuit for charging and the maximum induction received power conversion and power transmitted to the mobile phone, remote control, MP3, PMP, PDA and charging a break of wire by charging power to the battery of a variety of electronic devices that require and to prevent accidents due to short circuit and has its features to facilitate handling compact and lightweight. 본 발명은 소정의 전원을 공급받아서 전자파의 유도 자기장을 발생하는 송신패드 및 충전용 전자기기의 배터리 충전용 내외장형 수신용 모듈을 사용하여 핸드폰, 리모콘, MP3, PMP, PDA 및 배터리의 충전이 필요한 다양한 전자기기들의 전원충전을 위하여 송신패드위에 위치시켜 무접점ㆍ무선으로 동시에 충전할 수 있도록 어댑터 및 송신패드로 구성된 송신모듈과, 송신모듈 및 수신모듈을 구비한 소형ㆍ경량의 무선 전력 송수신 장치에 관한 것이다. The present invention takes supplies a predetermined power for charging of the use of the transmission pad and charged within the external reception module for the battery in charging the electronic device for generating an induced magnetic field of the electromagnetic cell phone, remote controller, MP3, PMP, PDA and battery in to position on the transmission pad non-contact and radio at the same time the wireless power transmission and reception of a compact and light weight having a transmitter module and a transmitting module and a receiving module, adapted to the adapter and transmits the pad to charge the device to the power charge of the various electronic devices It relates. 종래기술로는 전기에너지를 공급하는 전선들의 접촉에 의하여 전력이 전달되도록 구성된 핸드폰, MP3 및 PDA 등의 배터리를 충전하기 위하여서는 각각의 기종에 맞는 배터리 충전기가 필요하며 유선에 의한 충전 시 충전기의 접점단자의 접촉을 확인하여야 하는 번거러움과, 접점단자들이 대기 중에 노출되어 절연물질의 적층 및 부식에 의하여 사용할 수 없는 경우가 발생하거나 습기에 노출되어 충전 시 접점을 통한 감전의 위험성 및 방전이 발생하는 등의 문제점과 이외에 동시에 다양한 기종 및 다양한 전기기기들의 충전이 불가능한 문제점과, 부피가 비교적 크고 무거우며 충전 시 걸려온 전화를 받기가 불편하고, 핸드폰 배터리 방전시 일시적 충전을 위해 일회용 배터리 충전기를 사용하나 재충전이 불가능하다는 문제점이 있다. In the prior art In order to charge the configured mobile phone, a battery, such as MP3 and PDA so that power is transmitted by contact of the wires for supplying the electric energy necessary to a battery charger suitable for each type and contact of the charger during charging due to the wire beongeoreoum and to be checked the contact terminal, the contact terminals are exposed to the atmosphere is occurs if it is not available by the deposition and erosion of the insulating material, or exposed to moisture, such as a shock hazard, and discharged through the contact charging occurs problems and in addition at the same time, a variety of models and Roasting variety that can not be charged issues of electrical appliances and a large volume of relatively heavy rechargeable single use disposable battery charger for temporary charging cellphone battery discharge uncomfortable receive a call during charging, there is a problem impossible. 본 발명이 이루고자 하는 기술적 과제는 상기와 같은 종래기술의 문제점을 인식하고 창안된 것으로, 노이즈필터, 정류회로, 주파수 변환회로, 정전압 회로 및 다양한 크기와 출력의 전자파의 유도 자기장을 발생할 수 있도록 전기신호를 제어하는 출력제어부로 구성된 AC어댑터와 AC어댑터에서 전송된 전기신호로 전자파의 유도 자기장을 발생하는 송신코일로 이루어진 송신패드로 구성된 송신모듈를 구비하며, 상기 송신패드에서 발생한 전자파의 유도 자기장을 수신하기 위하여 솔레노이드 혹은 스파이럴구조의 수신코일과 수신된 전기에너지를 높은 효율로 출력단으로 전송하기 위한 공진 및 임피던스 매칭용 가변커패시터를 거쳐서 나온 신호를 정류하는 정류 회로와 정류되어 소정의 전류와 전압을 가진 전기에너지를 충전하는 충전회로 및 보호 The present invention has to be aware of the problems of the prior art and are created, a noise filter, a rectifier circuit, a frequency converting circuit, a constant voltage circuit and the electrical signal to generate an electromagnetic wave induced magnetic field from a wide variety of sizes and output and a control transmission modyulreul configured to output control AC adapter and the electrical signal sent from the AC adapter consisting in the transmission pad made of a transmitting coil for generating an induced magnetic field of the electromagnetic wave, and receiving the induced magnetic field of the electromagnetic wave generated by the transmission pad to be rectified with a rectifier circuit for rectifying a signal out through a resonator and a variable capacitor for impedance matching for transmitting the output of the electrical energy received and the receiving coil of the solenoid or spiral structure with a high efficiency of electric energy having a predetermined current and voltage a charging circuit for charging and protection 로로 구성된 수신모듈을 구비하고 최대 유도 무선 전력 송수신 장치를 구현하여 핸드폰, 리모콘, MP3, PMP, PDA 및 충전이 필요한 전기기기의 배터리에 전원을 충전함으로써 전선의 단선, 및 누전에 의한 안전사고를 예방할 수 있고 소형ㆍ경량으로 설치가 간단하고 충전 시 걸려온 전화를 용이하게 받을 수 있도록 하는데 그 목적이 있다. By providing a furnace configured to receive the module and charging power to the battery of the electric device are mobile phones, remote control, MP3, PMP, PDA and the charge required to implement the maximum induction wireless power transmission device to prevent accidents caused by disconnection, and short-circuit of the wire can and has the purpose to allow the installation of compact and lightweight, simple and easy to get to a call during charging. 발명의 또 다른 목적은 AC어댑터와 송신용 유도 코일과 상기 유도코일과 공진을 이루기 위한 커패시터를 구비하고 최대한 효율이 높은 전자파의 유도 자기장을 발생하는 송신패드로 구성된 송신모듈과, 수신용 유도코일과 공진회로를 형성하면서 출력단과는 임피던스 매칭을 위한 가변커패시터를 구성하여 최대한 높은 효율로 수신 전기에너지를 얻을 수 있으면서 소형ㆍ경량으로 설계 제작되어 핸드폰, 리모콘, MP3, PMP, PDA 및 충전이 필요한 전기기기들의 충전용 접점단자에 맞는 내외장형 수신모듈을 제공함으로써 하나의 송신패드위에서 무접점ㆍ무선으로 다양한 전기기기들의 충전용 배터리를 효율적으로 신속하게 충전할 수 있고 유선충전 시 발생할 수 있는 여러 가지 불편을 모두 해결하는데 있다. A further object of the invention is an AC adapter and a transmission provided with a credit induction coil and a capacitor for making the induction coil and the resonance and transmission module configured to transmit the pad for generating the induced magnetic field with a high maximum efficiency of the electromagnetic wave, and the receiving the induction coil and electrical device, forming a resonance circuit output stage and is to configure a variable capacitor for impedance matching while to obtain the received electrical energy to the highest possible efficiency is designed as compact and light weight that requires mobile phone, remote control, MP3, PMP, PDA and the charge of a number of discomfort in by providing external access module may be charged to the rechargeable battery of one of the transmitting pads on the various electrical equipment in non-contact and wireless efficiently quickly as may occur in the wired charging for charge contact terminals everyone has to solve. 발명의 또 다른 목적은 충전시 수신모듈내의 용량이 작은 충전용 배터리와 핸드폰등 전자기기내의 충전용 배터리를 동시에 충전하여 수신모듈은 무선전력 변환 기능 외에 전자기기내 배터리의 방전시 응급시 짧은 시간 동안 전자기기내 전원공급을 할 수 있는 용도로도 사용되어질 수 있도록 하는데 있다. A further object of the invention is received, charging the rechargeable battery in the electronic device such as a small rechargeable battery and the cell phone for the capacitor in the receiving module during charging at the same time the module for a short time during an emergency discharge of a battery in addition to wireless power conversion electronics unit It is to be used for the purpose to be capable of a power supply within the electronic apparatus. 본 발명은 소정의 전원 공급하여 전자파의 유도 자기장을 발생하는 송신패드 및 충전용 전자기기의 내외장형 수신용 모듈을 사용하여 핸드폰, 리모콘, MP3, PMP, PDA 및 배터리의 충전을 필요로 하는 다양한 전자기기들의 전원충전을 위하여 송신패드위에서 무접점ㆍ무선으로 동시에 여러 대의 충전용 전자기기들을 배터리를 충전할 수 있는 송신패드로 구성된 송신모듈과 상기 송신모듈 및 수신모듈을 구비한 소형ㆍ경량의 무선 전력 송수신 장치에 관한 것이다. The present invention is given of a power supply by using my external reception module for transmitting pad and charging the electronic device for generating an induced magnetic field of the electromagnetic cell phone, remote controller, MP3, PMP, various electronics that require charging of the PDA and the battery of a compact and light weight having a transmission module and the transmission module and a reception module configured of multiple charging for electronic equipment at the same time as a non-contact and radio on the transmitting pads as a transmission pad that can charge the battery to the power charge of the devices wireless power It relates to a transmitting and receiving device. 본 발명은 상기와 같은 종래기술의 문제점을 해결하기 위하여 창출된 것이다. The present invention was created to solve the problems of the prior art. 본 발명의 용이하게 이해할 수 있도록 하는 도면에 대하여 살펴본다. It now is made to the drawings to make easily understood the present invention. 도1은 본 발명에 따른 AC 어댑터와 송신패드로 구성된 송신모듈과 수신모듈로 구성된 소형ㆍ경량의 무선 전력 송수신장치의 개략도이며, 도2는 본 발명에 따른 AC 어댑터와 송신패드에 내장된 회로의 블록다이야 그램과 수신모듈에 내장된 회로의 블록다이야그램을 나타낸 것이다. 1 is a schematic view of a wireless power transmission apparatus of the compact and light-weight consisting of the transmission module and the receiving module is configured as an AC adapter and the transmission pad in accordance with the invention, Figure 2 is of a circuit built in the AC adapter and the transmitting pad according to the invention It shows a block diamond g of the circuit built in the block diamond gram and receiving module. 도3은 본 발명의 실시 예를 위하여 설계 제작된 스파이럴 송신코일을 나타낸 것이고, 도4는 본 발명의 실시 예를 위하여 설계 제작된 스파이널 코일로 구성된 중계코일과, 중계코일과 공진회로를 형성하기 위한 공진커패시터 구성의 중계기 및 소정거리의 스파이널 코일로 구성된 송신코일을 보여주고 있다. Figure 3 shows the embodiment of design and production of the spiral transmission coil to the present invention, Figure 4 is for forming a relay coil and a relay coil and a resonance circuit composed of the seupayineol coil designed and fabricated for the embodiment of the present invention It shows the transmitter coil is configured as a repeater and seupayineol coil having a predetermined distance between the resonance capacitor configuration. 도5는 본 발명의 실시 예를 위하여 설계 제작된 스파이널 코일로 구성한 중계코일 과, 중계코일과 공진회로를 형성하기 위한 공진커패시터와, 상기 중계코일 내부에 스파이널 코일로 구성된 송신코일을 보여주고 있으며, 도6은 본 발명의 실시 예를 위하여 설계 제작된 하나의 자성체 코어에 유도코일을 감은 수신코일을 나타낸 것이다. Figure 5 is showing the embodiment of design and production of the resonant capacitor for forming a relay coil and a relay coil and a resonant circuit configured to seupayineol coil, a transmission coil consisting seupayineol coil within the relay coil to the present invention, Figure 6 shows a receiving coil wound around the induction coil on a magnetic core made to the design of an embodiment of the present invention. 도7은 본 발명의 실시 예를 위하여 설계 제작된 하나의 자성체를 공통코어로 사용하여 수신코일과 중계코일을 감아서 구성한 수신코일을 나타낸 것이며, 도8은 일반적인 스파이널 코일로 구성한 수신코일을 보여주고 있다. 7 will showing an embodiment the receiving coil configured by winding a receiver coil and a relay coil, using one of the magnetic material the design made of a common core to the present invention, Figure 8 shows a receiving coil configured as a general seupayineol coil have. 도9는 본 발명의 실시 예를 위하여 설계 제작된 도5의 송신코일과 동일한 구조로 형성한 수신코일을 나타낸 것이며, 도10은 본 발명에 따라 설계 제작된 수신모듈의 회로도이다. 9 will illustrating a receiving coil formed of the same structure as the transmitter coil of the Figure 5 design made to the embodiment of the present invention, Figure 10 is a circuit diagram of the receive module designed and manufactured in accordance with the present invention. 본 발명에 따른 구성수단들을 구체적으로 살펴본다. It specifically is described in the configuration method according to the invention. 본 발명은 무선으로 전력을 수신할 수 있도록 전자파의 유도 자기장을 발생하기 위하여 설계 제작된 AC 어댑터(15)와 송신패드(13)로 구성된 송신모듈과, 상기 송신모듈에서 발생한 전자파의 유도 자기장을 수신하여 유도기전력을 발생하는 수신코일(71)과, 수신된 유도기전력을 극대화하여 출력단으로 전송하기 위하여 수신코일(71)과 병렬로 체결된 공진 및 임피던스 매칭을 위하여 사용되는 가변커패시터(72)와, 가변커패시터(72)를 거쳐서 나온 신호를 다이오드로 정류하는 정류회로(73)와, 정류된 전압을 평활하여 DC전원으로 변환하는 평활콘덴서(74)로 이루어진 수신모듈로 크게 2가지로 구성된 소형ㆍ경량의 무선 전력 송수신장치이다. The invention receives the electromagnetic wave induced magnetic field of the called out by the design and production of the AC adapter 15 and the transmission module and the transmission module configured to transmit the pad (13) to generate an induced magnetic field of the electromagnetic wave to receive power wirelessly and a variable capacitor 72 which is used for the resonance and impedance matching entered in parallel with the reception coil 71 in order to maximize the receive coil 71, a receiving induced electromotive force which generates an induced electromotive force to transmit the output to, and a rectifying circuit 73 for rectifying the signal out through a variable capacitor 72, a diode, compact and lightweight configured to smooth the rectified voltage to, there are two main to the receiving module consisting of a smoothing capacitor 74 to be converted to a DC power source of a wireless power transmission apparatus. 상기 송신모듈은 핸드폰, 리모콘, MP3, PMP, PDA 및 배터리의 충전이 필요한 다양한 전기기기들의 전원충전을 위하여 수신모듈이 필요로 하는 전자파의 유도자기장을 발생하는 장치로서 가정 또는 산업용으로 사용되는 일반적인 전원 AC 220V/110V로부터 입력되는 전원에 포함된 노이 즈를 제거하는 노이즈제거필터(32)와, 노이즈가 제거된 교류전원(신호)을 정류하는 1차 정류회로(33)와, 정류된 DC전원을 스위칭 회로를 사용하여 수십㎑내지 수백㎑ 출력의 주파수를 가진 전기신호로 변환하는 신호제어부(34)와, 신호제어부에서 소정의 출력과 주파수를 가진 전기신호를 필요한 전압으로 변환하는 트랜스포머(35)와 이를 정류하는 2차 정류회로를 거쳐서 필요한 정전압 전원으로 만든 후 필요한 출력과 주파수를 가진 전기신호로 변환하여 송신코일로 전송하는 주 The transmission module is a common power source is used as cell phone, remote controller, MP3, PMP, a home or industrial for power charge of the various electrical devices that require charging of the PDA and a battery a device for generating an induced magnetic field of the electromagnetic waves that are required by the receiving module, and a noise removal filter 32 to remove the noise contained in the power input from the AC 220V / 110V, and the first rectifier circuit 33 for rectifying the AC power supply (signal), the noise is removed, a rectified DC power source and a signal control section 34 for converting into an electric signal having a frequency of several tens ㎑ to several hundred ㎑ output using a switching circuit, in the signal control unit and the transformer (35) for converting the voltage necessary for an electric signal having a predetermined power and frequency and via a second rectifier circuit for rectifying it into an electrical signal having a desired output frequency and then made to the main constant voltage power supply required for transmitting to the transmitting coil 파수 및 출력을 제어하는 출력제어부(37)와, 출력제어부(37)를 거쳐서 나온 신호를 전송받아서 전자파의 유도 자기장을 발생하는 송신코일로 구성되어 있다. And an output control unit 37 for controlling a frequency and an output, receives the transmitted signal from the output via the control unit 37 consists of a transmitter coil which generates an induced magnetic field of the electromagnetic wave. 상기 출력제어부는 다양한 충전용전자(전기)기기에 필요한 전기에너지를 고려하여 송신출력을 제어할 수 있도록 구성되어 있다. The output control section is configured to control the transmission power in consideration of the electrical energy required for the various charging for electronic (electric) devices. 상기 출력제어부에서 출력되는 신호의 출력을 일정하게 유지하기 위하여 출력신호를 감지하여 신호제어부로 피드백시켜 출력제어부에서 송신코일로 전송되는 전기신호의 출력이 증가하면 감소시키고 출력이 감소하면 증가시켜 일정한 송신출력을 유지시켜주는 피드백회로를 가진다. To the to the output control to maintain a constant output of the signal outputted from detecting the output signal by feedback as a signal control unit decreases the output of the electrical signal increases to be transmitted by the transmitting coil in the output control to increase when the output is reduced a certain transmission It has a feedback circuit to maintain the output. 상기 어댑터에서 발생한 소정의 주파수 및 출력전압을 일정하게 발생하는 신호에 기초하여 충전에 필요한 전자파의 유도 자기장을 높은 효율로 발생하도록 유도코일과 커패시터를 체결시켜 구성한 송신패드가 설계 제작된다. Is based on a signal to a constant predetermined frequency and output voltage generated in the adapter generates the transmission pad configured to fasten the induction coil and the capacitor to generate an induced magnetic field of the electromagnetic wave required for charging at a high efficiency can be designed and manufactured. 상기 AC어댑터(15)와 송신패드(13)로 구성되어 전자파의 유도 자기장을 발생하는 송신부를 송신모듈이라 한다. The consists of an AC adapter 15 and the transmission pad 13 is referred to as a transmission module sending unit for generating an induced magnetic field of the electromagnetic wave. 상기 AC어댑터와 송신패드는 필요에 따라 일체형 또는 다소 거리를 두고 분리하는 분리형으로 설계 제작할 수 있다. The AC adapter and the transmission pad may be manufactured to design with a detachable separating distance-one or less, as needed. 상기 송신모듈에서 발생한 전자파의 유도 자기장을 수신하기 위하여 솔레노이드 혹은 스파이럴구조의 수신코일과 수신된 전기에너지를 높은 효율로 출력단으로 전송하기 위하여 공진회로 및 전자파의 유도 자기장을 중계하는 중계코일이 부가로 연결되며, 상기 공진회로 및 중계코일을 거쳐서 나온 신호를 정류하는 정류회로와 정류되어 소정의 전류와 전압을 가진 전기에너지를 충전하는 충전회로와, 핸드폰, 리모콘, MP3, PMP, PDA 및 배터리의 충전이 필요한 다양한 전자(또는 전기)기기들의 전원충전을 위하여 각각의 전자기기에 전원을 충전하기 위하여 형성된 접점들과 결합되는 접속단자를 구비한 수신모듈(12)로 구성되어 있다. Connecting the electrical energy received and the receiving coil of the solenoid or spiral structure of the resonant circuit and to the relay coil part for relaying the induced magnetic field of the electromagnetic wave to transmit the output to a high efficiency in order to receive the induced magnetic field of the electromagnetic wave generated by the transmission module and, is rectified with a rectifier circuit for rectifying a signal out through the to the resonance circuit and the relay coil is charged with a charging circuit to charge the electrical energy having a predetermined current and voltage, cell phone, remote controller, MP3, PMP, PDA and battery It consists of a receiving module (12) having a connection terminal coupled with the contact formed in order to charge the power supply to each of the electronic unit in order to charge the power of various electronic (or electrical) equipment is required. 상기 수신코일, 증폭중계기(상기 중계코일에 해당함) 및 이들의 구성회로에 대하여서는 본원 출원인이 출원한 출원번호 10-2004-0093696호 및 10-2005-0059562호에 자세하게 기재되어 있다. Among properties in the receiving coil, an amplifier relay (corresponding to the relay coil) and a circuit arrangement thereof is described in detail in the present applicant filed an application number 10-2004-0093696 and No. 10-2005-0059562 call. 본 발명에 따른 송신모듈의 출력전압, 주파수 및 출력전력을 제어하여 필요한 송신출력으로 전자파의 유도자기장을 송신패드를 통해서 송신하고, 수신모듈의 접속단자를 충전을 원하는 다양한 전자기기에 형성되어 있는 접점에 맞추어 설계 제작할 경우에 핸드폰(11), MP3, 및 PDA 뿐만 아니라 충전이 필요한 대부분의 전자기기들에 내장시키거나 외부의 접점에 수신모듈(12)에 형성된 접속단자를 체결하여 충전할 수 있다. Contact which is transmitting through the transmission pad the induced magnetic field of the electromagnetic wave to transmit the power required to control the output voltage, frequency and output power of a transmission module in accordance with the present invention, is formed in the connection terminals of the receiving module in a variety of electronic apparatus desired charging in the design as cell phone (11), MP3, and the PDA if manufactured to fit well as charging can either embedded in most electronic devices that require or fastening a connection terminal formed on the receiving module 12 to the external contact for charging. 본 발명의 송신패드와 AC어댑터는 필요에 따라 일체형 또는 도1에서와 같이 분리형으로 설계 제작할 수 있다. Transmission pad and the AC adapter of the present invention can be prepared by a removable design, as in the one-piece or 1, if necessary. 본 발명에 따른 송신패드와 수신모듈을 구비한 소형ㆍ경량의 무선 전력 송수신 장치에 관한 구체적이고 다양한 실시 예를 살펴본다. Specific and looks at the various embodiment of the wireless power transmission and reception system for a compact and light weight having a transmission pad and a reception module according to the present invention. 본 발명에 따른 구체적인 실시 예를 도면에 기초하여 살펴본다. It looks at the basis of a specific embodiment according to the invention in the drawings. 먼저 본 발명에 따른 송신모듈에 대하여 살펴본다. First looks at the transmission module according to the present invention. 송신모듈은 일반적인 전원 AC 220V 또는 다양한 형태로 제공되는 전원으로부터 입력되는 전원에 포함된 노이즈를 제거하는 노이즈제거필터와 노이즈가 제거된 교류전원(신호)을 정류하는 정류회로(33)와, 정류된 DC전원을 스위칭 회로를 사용하여 수십㎑내지 수백㎑ 출력의 주파수를 가진 전기신호로 변환하는 신호제어부(34)와, 신호제어부(34)에서 소정의 출력과 주파수를 가진 전기신호를 필요한 전압으로 변환하는 트랜스포머(35)와, 이를 정류하는 정류회로(36)를 거쳐서 필요한 정전압 전원으로 만든 후 필요한 출력으로 공급하면서 소정의 주파수와 전압을 가진 신호를 송신코일(39)로 전송하는 주파수 및 출력을 제어하는 송신 출력제어부와, 송신 출력제어부(37)를 거쳐서 나온 신호를 전자파의 유도 자기장을 발생하는 송신코일로 구성되어 다양한 충 And the transmission module is a rectifier circuit 33 for rectifying the common power supply AC 220V or various forms of AC power supply noise rejection of removing the noise contained in the power that is input from the power filter and noise is removed is provided to the (signal), the rectified converting the DC power into a voltage necessary for an electric signal having a predetermined power and frequency from the signal controller 34, a signal control section 34 for converting into an electric signal having a frequency of several tens ㎑ to several hundred ㎑ output using a switching circuit transformer 35 and, as through a rectifier circuit 36 ​​for rectifying this, supply of the power required, create the required constant voltage power supply controls the frequency and an output for transmitting a signal having a predetermined frequency and voltage to the transmitting coil 39 to various charge composed from the signal via the transmission power control, a transmission output control unit 37 to the transmitting coil for generating an induced magnetic field of the electromagnetic wave 용전자기기에 필요한 전기에너지를 고려하여 송신출력을 제어하여 공급하는 구성들을 구비한다. In consideration of the electrical energy necessary for the electronic apparatus includes a configuration in which supply controls the transmission output. 상기 출력제어부에서 출력되는 전기신호의 출력을 일정하게 유지하기 위하여 송신패드로 전송되는 출력신호를 감지하여 신호제어부로 피드백시켜 출력제어부에서 송신코일로 전송되는 전기신호의 출력이 증가하면 감소시키고 출력이 감소하면 증가시켜 항상 일정한 송신출력을 유지시켜주는 피드백회로를 가진다. It decreases as the order in the output control to maintain a constant output of the electric signal output detecting the output signal transmitted by the transmitting pad was fed back to the signal control the output of the electrical signal increases to be transmitted by the transmitting coil in the output controller and outputs a reduced increases and always has a feedback circuit that maintains a constant transmission power. 상기 송신모듈에서 유도코일이 내장된 송신패드의 앞단에 설치되는 AC어댑터(15)는 다양한 방법에 설계 제작하여 안정된 출력을 가지면서 소정의 주파수와 AC 출력전압을 발생할 수 있도록 구성되어야 한다. AC adapter 15, which is installed on the front end of the transmission pads induction coil is embedded in the transmission module while having the stable output and designed in a variety of ways to be configured to cause a predetermined frequency and the AC output voltage. 본 발명에 따른 송신패드에 내장된 송신코일의 구성은 수신모듈(12)에 내장된 수신코일에서 최대한 많은 전기에너지가 유도될 수 있도록 전자파의 유도자기장을 발생할 수 있도록 다양하게 형성할 수 있다. The configuration of the transmission coil embedded in the transmission pad according to the present invention can be variously formed to generate an induced magnetic field of the electromagnetic wave to be a large as possible electric energy induced in the receiving coil embedded in a receiving module (12). 표1은 도3에서 구성한 스파이널 코일의 직경, 감은 수, 내경 및 외경을 나타낸 것이며, 본 발명의 실시 예에서 사용된 송신코일의 샘플1에 해당한다. Table 1 shows the diameter will, be wound, inner and outer diameters of seupayineol coils configured in Fig. 3 corresponds to the sample 1 of the transmitter coil used in an embodiment of the present invention. 표2는 도4와 같이 설계 제작된 스파이럴 코일로 전자파의 유도자기장을 중계를 위한 중계코일과, 중계코일과 공진을 형성하기 위해 공진커패시터를 연결 구성한 스파이럴형 중계기와 소정거리의 스파이럴 송신코일의 직경, 감은 수, 내경 및 외경을 나타낸 것이며, 본 발명의 실시 예에서 사용된 송신코일의 샘플2에 해당한다. Table 2 shows the diameter of the relay coil, the relay coil to form a resonant configured connecting the resonant capacitor spiral repeater and the spiral transmission coil of a predetermined distance for relaying the induced magnetic field of the electromagnetic wave into a spiral coil designed and manufactured as shown in FIG. 4 , it can sense, will showing the inner and outer diameters, and corresponds to sample 2 of the transmitter coil used in an embodiment of the present invention. 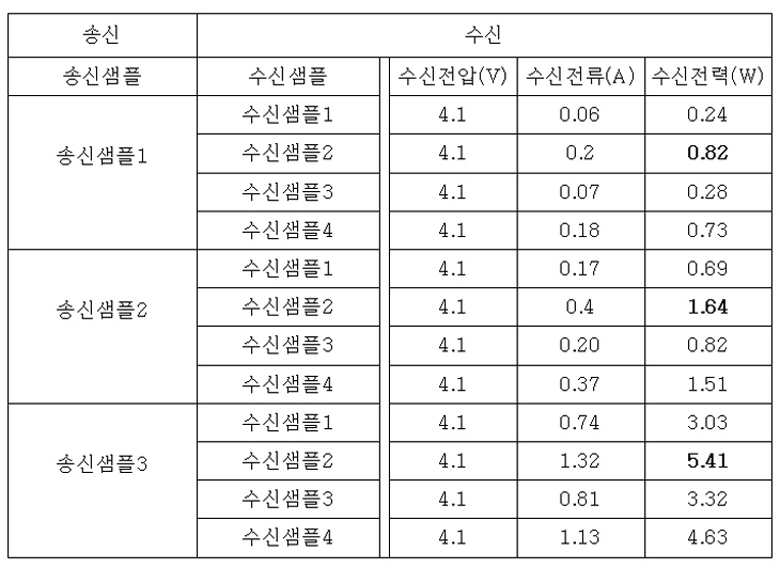 표3은 도5와 같이 설계 제작된 스파이럴 코일로 전자파의 유도 자기장의 중계를 위한 중계코일과, 중계코일과 공진회로를 형성하기 위한 커패시터로 구성되어진 중계기와 상기 전자파의 유도자기장의 강화를 위한 중계코일 내부에 스파이럴 코일로 송신코일을 구성한 송신코일의 샘플에 대한 중계코일 및 송신코일의 직경, 감은 수, 내경 및 외경을 나타낸 것이며, 본 발명의 실시 예에서 사용된 송신코일의 샘플3에 해당한다. Table 3 shows relays for strengthening of the relay coil, the relay coil and the induced magnetic field of the repeater and the electromagnetic been composed of a capacitor for forming a resonant circuit for the relay of the electromagnetic induction field into a spiral coil designed and manufactured as shown in Fig. 5 the diameter of the relay coil and the transmit coil for the transmission coil sample configure the transmit coil in the spiral coils in the coil interior, it can be wound, will showing the inner and outer diameters, and corresponds to sample 3 of the transmitting coil in the embodiment of the present invention . 송신코일과 중계기는 유선으로 연결되어져 있지 않으며, 패 드의 크기와 형태에 따라 중계코일 및 송신코일을 감은 수, 외경 및 내경 등을 다르게 수성할 수 있다. Transmitter coil and the relay do not been connected by wire, and the number of winding the relay coil and the transmitting coil in accordance with the size and shape of the pad, the outer diameter and the inner diameter or the like can be different from the aqueous. 본 발명에 따라 설계 제작되는 송신코일은 상기 샘플1, 샘플2 및 샘플3에서 설계 제작된 스파이럴로 구성된 송신코일 대신에 본 발명의 특허 출원인 2005년 출원한 출원번호 10-2005-0059562호에 기재된 자성체 코어와 코일을 이용하여 송신코일과 중계코일(상기 특허출원에서는 전자파의 유도자기장 증폭중계기라고 기재되어 있습니다)을 구성할 수 있다. Transmitting coil is designed in accordance with the present invention the sample 1, sample 2 and the magnetic material described in Patent Application No. 10-2005-0059562, filed by the applicant in 2005 of the present invention, instead of transmitting coil composed of a spiral design produced in Sample 3 transmitter coil and the relay using the coil core and the coil can form an (in the above patent application is described as the electromagnetic induction-magnetic-field amplification repeater). 다음은 본 발명에 따라 설계 제작된 수신코일에 대하여 구체적으로 살펴본다. Then looks specifically at the receiving coil with respect to the designed and manufactured in accordance with the present invention. 핸드폰, MP3 및 PDA 등에 채용될 수 있는 내외장형 수신모듈에 삽입되도록 설계 제작된 소형ㆍ경량의 수신코일의 샘플구조들을 살펴본다. Cell phone, looks at the structure of the sample receiving design of the fabricated compact and lightweight coil to be inserted within the external reception module or the like that can be employed in MP3 and PDA. 도6은 자성체 코어에 유도코일을 감은 솔레노이드 코일로 구성한 수신코일이며, 표4는 수신 솔레노이드 코일의 직경, 높이, 코일종류 및 감은 수를 나타낸 것으로 수신코일 샘플1이다. 6 is configured to receive the solenoid coil wound around the induction coil to the magnetic core coil, Table 4 is a sample receiving coil 1 represents a number diameter of the receiving solenoid coil height and coil type winding. 도7은 하나의 자성체(페라이트)를 공통코어로 사용하여 수신코일과 전자파의 유도자기장을 중계하는 중계코일을 감아서 구성한 수신코일이며, 표5는 수신코일 및 중계코일의 직경, 높이, 코일규격 및 감은 수를 표시한 것으로 수신코일샘플2에 해당한다. 7 is received is configured by winding the relay coil relaying receiving coils and electromagnetic waves induced magnetic field of using one of the magnetic body (ferrite) with a common core coil, and Table 5 the receiving coil and the relay diameter of the coil, the height, the coil size and those shown to be wound corresponds to the receiving coil 2 samples. 도8은 일반적인 스파이럴 코일로 구성한 수신코일이며, 표6은 코일의 직경, 감은 수, 내경 및 외경을 나타낸 것으로 수신코일샘플3에 해당한다. 8 is a receiving coil configured as a general spiral coil, Table 6 corresponds to a receiving coil sample 3 illustrates the diameter of the coil, it can be wound, inner and outer diameters. 도9는 도5의 송신코일과 동일한 구조로 외부에는 스파이럴 중계코일과 공진회로 구성을 위한 커패시터를 사용하여 전자파의 유도 자기장을 강화하는 중계기를 구성하고, 내부에 스파이럴 수신코일로 결합된 구조로 수신코일 샘플4에 해당한다. 9 is received by the structure coupled to the spiral receiving coil inside configure the repeater to enhance the induced magnetic field of the electromagnetic waves, and by using the capacitor for the configuration to outside spiral relay coil and the resonance circuit of the same structure as the transmitter coil of Figure 5 sample 4 corresponds to the coil. 표7은 상기 수신코일 샘플4에 사용된 중계코일 및 수신코일의 직경, 감은 수, 내경 및 외경을 나타낸 것이다. Table 7 shows the relay coil and the diameter of the receiving coil, winding number, internal and external use to the receiving coil 4 samples. 상기 도3내지 도9 및 표1내지 표7에서와 같이 구성한 송신코일 및 수신코일로 설계 제작된 송수신코일의 샘플들을 조합하여 핸드폰, MP3 및 PDA 등에 채용될 수 있는 내외장형 수신모듈에 삽입되어 소형ㆍ경량의 무선 송수신장치를 얻기 위한 샘플구조에 있어서, 상기 송신모듈의 출력제어부에 송신출력을 10W, AC 100㎑ 주파수로 송신하여 전자파의 유도자기장을 발생시키고, 상기 수신코일 샘플1내지 4에서 설계 제작한 다양한 수신 샘플코일들을 사용하여 수신모듈의 충전 회로도를 구성하여 출력단에서 DC 전력이 3.7V 전자기기(핸드폰) 충전용 배터리에 전기에너지를 충전 시에 수신전압, 전류 및 전력 값을 측정한다. And FIG combination of design samples of the produced receiving coil to the transmitting coil and a receiving coil configured as shown in the 3 to 9 and Tables 1 to 7 is inserted in an external reception module that can be employed in cell phones, MP3 and PDA, etc. Small and according to the sample structure to obtain a light weight of the mobile transceiver, and transmitting a transmission output to the output control unit of the transmission module to 10W, 100㎑ AC frequency to generate an induced magnetic field of the electromagnetic wave, the receiving coil design in samples 1 to 4 configuring the charging circuit of the receiving module with the various sample receiving coil is produced by a 3.7V DC power electronic device (mobile phone) measures the received voltage, current and power values ​​of electrical energy to charge the rechargeable battery at the output terminal. 수신모듈은 핸드폰 등의 전자기기에 필요한 전기에너지를 충전하는 수단만 내장시키거나 소정의 용량을 가진 충전용 배터리를 상기 충전수단과 동시에 내장시켜 병렬로 동시에 충전되도록 구성할 수 있다. The receiving module may be configured to be built only to means for charging the electric energy required for the electronic apparatus such as a mobile phone, or by a built-in rechargeable battery having a predetermined capacity at the same time as the charging means charging in parallel. 상기 수신코일샘플 1내지 4의 뒷단에 높은 효율로 전기에너지를 전송하기 위하여 공진 및 임피던스 매칭용 가변 커패시터가 체결되고, 커패시터를 거쳐서 나온 전기신호를 다이오드를 이용하여 직류신호로 변환하기 위한 정류회로와, 정류된 신 호를 평활하기 위한 커패시터로 구성되며 충전을 필요로 하는 전자기기의 배터리에 전기에너지를 충전하게 된다. And a resonance and impedance matching for the variable capacitor entered to transmit the electrical energy with high efficiency to the rear end of the receiving coils of Samples 1 to 4, a rectifier circuit for converting an electrical signal from through a capacitor to a DC signal by using a diode and , composed of a capacitor for smoothing the rectified signal and to charge the electric energy to the battery of an electronic apparatus which require charging. 즉, 도10의 수신모듈은 수신코일에서 수신된 유도기전력을 출력단으로 높은 효율로 전기에너지를 전송하기 위하여 공진 및 임피던스 매칭용 가변 커패시터를 수신코일과 병렬로 체결 구성하고, 공진 및 임피던스 매칭용 가변 커패시터를 거쳐서 전송된 신호를 정류 다이오드와 평활커패시터를 거쳐서 정전압 및 보호회로를 거친 후, 수신모듈 내에 내장된 소정용량의 3V내지 4V 충전용 배터리와 전자기기내의 3내지 4V 충전용 배터리에 동시에 전기에너지를 충전할 수 있는 구성으로 이루어지거나 전자기기내의 3내지 4V로 충전용 배터리에만 충전할 수 있도록 수신모듈로 구성할 수 있다. That is, the receiving module 10 is a variable for the resonance and impedance variable fastening a capacitor to the receiving coil and a parallel arrangement, and the resonance and impedance for matching matched in order to transmit electrical energy to the induced electromotive force is received by the receiving coil with high efficiency into an output terminal after the signal transmitted via the capacitors subjected to a constant voltage and a protection circuit via a rectifier diode and a smoothing capacitor, at the same time electric energy for 3 to for 4V charged battery within a predetermined amount of 3V to 4V rechargeable battery and electronic device contained in a reception module a has only to be configured to the receive module to charge rechargeable batteries of 3 to 4V or in the electronic apparatus consists of configurations that may be charged. 표8은 상기 본 발명의 실시 예에서 설계 제작한 송신코일의 샘플1내지 샘플3 각각에 대하여 상기 수신코일의 샘플1내지 샘플4에 대한 각각의 수신회로를 구성하여 출력단 전자기기의 충전배터리에서 측정한 충전하는 수신전압, 전류 및 전력 값을 나타낸 것이다. Table 8 is measured in the battery charge of the output terminal the electronic apparatus to configure each of the receiving circuit for Samples 1 to 4 of the receiving coil with respect to the Samples 1 to 3 each design produced transmission coil in the embodiment of the present invention It shows the filled receiving voltage, current and power values. 표8을 통해서 알 수 있듯이 전자파의 유도 자기장을 중계하는 중계코일을 결합한 송신코일과 전자파의 유도 자기장을 중계하는 중계코일을 결합한 수신코일로 전자파의 유도자기장을 발생하고 발생한 전자파 자기장을 수신하는 구조가 전자기기의 충전배터리에 전기에너지를 신속하고 높은 효율로 충전할 수 있는 높은 출력전력을 얻을 수 있다. Can be seen by the Table 8, as the structure which generates an induced magnetic field of the electromagnetic wave to the receiving coil combines the relay coil that relays the induced magnetic field of the transmitting coil and the electromagnetic wave which combines a relay coil for relaying the induced magnetic field of the electromagnetic wave and receiving an electromagnetic field generated fast electrical energy to charge the battery of an electronic apparatus, and it is possible to obtain a high output power can be charged with a high efficiency. 즉, 스파이럴코일 외부에 중계코일과 송신코일을 결합한 구성인 송신코일샘플3으로 송신패드를 구성하고, 수신코일 샘플2 구조인 하나의 페라이트 코어에 중계코일과 수신코일을 결합하여 구성한 수신모듈로 전자파의 유도 자기장을 송수신할 경우에 가장 큰 충전 수신전류인 1.32A와 충전전력 5.41W를 얻을 수 있었다. That is, the configuration for transmitting the pad in a spiral coil outside the relay coil and the configuration of the transmission coil Samples 3 combine the transmission coil to, and receiving coils Sample 2 structure of the electromagnetic wave as a receiving module configured to combine a relay coil and a receiving coil on the ferrite core in sending and receiving the induced magnetic field it can be obtained the largest charging current of 1.32A and receive charging power 5.41W. 상기 중계코일을 포함 하지 않는 일반 송신코일 샘플1을 사용하여 송신코일로 구성하고, 중계코일을 사용하지 않은 일반 솔레노이드로 구성된 수신코일 샘플1과 스파이럴 수신코일인 샘플3의 구조에서는 아주 낮은 0.24W, 0.28W의 충전전력을 얻었다. The structure consists of a transmitter coil using a regular transmission coil sample 1 does not include the relay coil and the receiving coil receives the sample 1 and the spiral coil is configured as a normal solenoid did not use a relay coil 3 samples very low 0.24W, to obtain a charge power of 0.28W. 본 발명에 따라 구성되는 전자파 유도자기장 발생을 위한 송신패드를 구성하는 송신코일은 상기 실시 예에서 설계 제작한 다양한 종류의 송신코일 외에 본 발명의 특허 출원인 2005년 출원한 출원번호 10-2005-0059562호에 기재된 자성체 코어와 유도코일을 사용하여 구성한 송신코일과 중계증폭기(본 발명의 중계코일에 해 당한다) 등을 사용하여 다양하게 구성할 수 있으며, 수신코일 또한 상기 실시 예에서 설계 제작한 다양한 종류의 수신코일 외에 본 발명의 특허 출원인 2005년 출원한 출원번호 10-2005-0059562호에 기재된 자성체 코어, 유도코일 및 가변커패시터를 사용하여 구성한 수신코일과 중계증폭기(본 발명의 중계코일에 해당한다) 등을 사용하여 다양하게 구성할 수 있다. Transmitting coils constituting the transmitting pads for electromagnetic induction-magnetic-field generating constructed according to the present invention is the embodiment design the filed patent application of the present invention in addition to various kinds of transmission coils 2005 manufactured Application No. 10-2005-0059562 call in the magnetic core and (gets hit by the relay coil of the present invention), the transmission coil and a relay amplifier configured with an induction coil may be variously configured using, for example, as described in, the receiving coil also design a variety of types produced in example receiving configured using the magnetic core, an induction coil and a variable capacitor as described in Patent Application No. 10-2005-0059562, filed by the applicant in 2005 of the invention in addition to the relay coil and the receiving coil amplifier (corresponds to the relay coil of the present invention), etc. use may be variously configured. 본 발명에 따른 송신모듈의 출력전압, 주파수 및 출력전력을 제어하여 송신출력을 제어하여 송신하고, 수신모듈의 접속단자를 충전을 원하는 다양한 전자기기에 형성되어 있는 접점에 맞추어 설계 제작할 경우에 핸드폰, 리모콘, MP3, PMP, PDA 뿐만 아니라 충전이나 전원공급이 필요한 대부분의 전자기기들에 내장 또는 외장형으로 설계 제작하여 배터리 충전에 적용할 수 있다. Cellphone when controlling the output voltage, frequency and output power of the transmission module according to the present invention transmits to control the transmission power, and create the design in accordance with the contact point which is formed a connection terminal of the receiving module in a variety of electronic apparatus desired to charge, and designed as an internal or external to most electronic equipment remote control, as well as MP3, PMP, PDA requires charging or power supply can be applied to battery charging. 본 발명의 송신패드와 AC어댑터는 필요에 따라 일체형 또는 도1에서와 같이 분리형으로 설계 제작할 수 있다. Transmission pad and the AC adapter of the present invention can be prepared by a removable design, as in the one-piece or 1, if necessary. 본 발명은 노이즈필터, 정류회로, 주파수 변환회로, 정전압 회로 및 다양한 크기와 출력의 전자파의 유도 자기장을 발생할 수 있도록 전기신호를 제어하는 출력제어부로 구성된 AC 어댑터와, 어댑터에서 전송된 전기신호외 연결된 송신코일로 전자파의 유도 자기장을 발생하는 송신패드로 구성된 송신모듈과, 상기 송신모듈에서 발생한 전자파의 유도 자기장을 수신하기 위하여 수신코일과 수신된 전기에너지를 극대화하기 위한 공진 및 임피던스 매칭 회로와 충전용 DC전원으로 변환하는 정류회로로 구성된 수신모듈을 구비하고 최대 유도 무선 전력 송수신 장치를 구현하여 핸드폰, 리모콘, MP3, PMP, PDA 및 충전이 필요한 기기의 배터리에 전원을 충전 함으로써 전선의 단선 및 누전에 의한 안전사고를 예방할 수 있고 소형ㆍ경량으로 설치가 간단하고 충 The invention connected outside the electric signal transmitted from the noise filter, a rectifier circuit, a frequency converting circuit, a constant voltage circuit and a variety of sizes and AC adapter, and the adapter is configured as an output control unit for controlling the electrical signal to generate an induced magnetic field of the electromagnetic wave of the output resonator and an impedance matching circuit and the charging in order to maximize the electrical energy received and the receiving coil to receive the electromagnetic waves induced magnetic field generated in the transmission module and the transmission module configured to transmit the pad for generating electromagnetic waves induced magnetic field by the transmitting coil and a reception module composed of a rectifier circuit for converting a DC power source and implementing a maximum induction wireless power transmission device to the cell phone, remote controller, MP3, PMP, disconnection or short circuit of the PDA and the wire by charging power to the battery of the device, the charging is necessary accidents can be prevented by a simple and compact and lightweight charging installation 전 시 걸려온 전화를 용이하게 받을 수 있는 작용효과가 있다. There are around during action and effect can be easily receive incoming calls. 발명의 또 다른 효과는 AC어댑터와 송신용 유도 코일과 상기 유도코일과 공진을 이루기 위한 커패시터를 구비하고 최대한 효율이 높은 전자파의 유도 자기장을 발생하는 송신패드와, 수신용 유도코일과 공진회로를 형성하면서 출력단과는 임피던스 매칭을 위한 가변커패시터를 구성하여 최대한 높은 효율로 수신 전기에너지를 수신모듈내 소형 충전 배터리와 전자기기내 충전 배터리에 공급하면서 소형ㆍ경량으로 설계 제작되어 핸드폰, 리모콘, MP3, PMP, PDA 및 충전이 필요한 전기기기들의 충전용 접점단자에 맞는 내외장형 수신모듈을 제공함으로써 하나의 송신패드위에서 무접점ㆍ무선으로 다양한 전기기기들의 충전용 배터리를 효율적으로 신속하게 충전할 수 있고 유선충전 시 발생할 수 있는 여러 가지 불편을 모두 해결하고 수신모듈내 소정 크 Another effect of the invention form the AC adapter and transmitting the induction coil and the induction coil and a capacitor for making the resonance and the transmission pad for generating the induced magnetic field with a high maximum efficiency of electromagnetic waves, the receiving induction coil and a resonance circuit and output end and is with a feed of variable receive electrical energy by configuring the capacitor with the highest possible efficiency for the impedance matching on the receiving module in a small rechargeable battery and charging the battery electronic device designed as compact and lightweight mobile phone, remote control, MP3, PMP , PDA, and the charging is to rapidly charge the rechargeable battery of the within the external reception by providing a module a transmitting pads on the various electrical equipment in non-contact and radio for the charge contact terminals of the necessary electrical equipment for efficiently and wire filling addresses all the various inconveniences that may occur when the receiving module within a given size 의 충전용 배터리를 이용하여 전자기기내 충전 배터리의 방전시 응급용 전자기기내 전원 공급으로도 사용할 수 있도록 하는데 있다. When the discharging of the charging battery to the electronic apparatus using the battery, the charging is to be used so that the emergency power supplies in electronic equipment. 상기 송신 출력제어부로부터 전송된 신호를 수신하여 솔레노이드 혹은 스파이럴형태의 송신코일로 전자파의 유도 자기장을 발생하는 송신패드로 구성된 전자파의 유도 자기장을 발생하는 송신모듈. Transmission module for receiving a signal transmitted from said transmission output control unit generates an induced magnetic field of the electromagnetic wave consisting of transmitting pad for generating the induced magnetic field of the electromagnetic waves transmitted by the solenoid or the coil of the spiral shape. 상기 신호제어부와 출력제어부를 하나로 묶어서 어댑터를 구성하고, 서로 유선으로 연결되되 분리하여 송신패드를 구성하며, 상기 어댑터는 송신패드에서 떨어져 공급전원과 인접하여 위치시키거나 송신패드 가까이 위치시키는 구성으로 이루어진 전자파의 유도 자기장을 발생하는 송신모듈. Configure the adapter bound to the signal control unit and output control one and separated doedoe each other connected by wire and configured to transmit the pad, the adapter is made of a construction in which adjacent to the power supply to the location to or located near the transmission pad away from the transmission pad transmission module for generating an induced magnetic field of the electromagnetic wave. 상기 중계기를 형성하고 있는 스파이럴코일 내부에 위치하며, 서로 유선으로 연결되지 않으면서 소정의 외경과 내경을 가지고 소정의 회수로 감은 스파이럴형태의 송신코일로 구성된 전자파의 유도 자기장을 발생하는 송신모듈. Transmission module for generating an induced magnetic field of the electromagnetic wave consisting of and positioned within the spiral coils, which form the relay, without being connected to each other by wire predetermined transmission coil of the spiral form with an outer diameter and an inner diameter wound by a predetermined number of times. 상기 송신모듈에서 발생한 전자파의 유도 자기장을 수신하는 수신코일과, 수신코일에 유기된 유도기전력을 이용하여 충전에 필요한 소정의 직류전기에너지로 변환하는 수신모듈로 구성된 소형ㆍ경량의 무선 전력 송수신장치. A receiving step of receiving the induced magnetic field of the electromagnetic coil and, by using the induced electromotive force induced in the receiving coil compact and lightweight wireless power transmission and reception devices, consisting of a receiving module for converting a predetermined DC electric energy required for charging generated in the transmission module. 상기 송신패드에서 발생한 전자파의 유도자기장을 수신하는 수신코일과, 상기 수신코일과 병렬로 연결되어 수신코일과 공진회로를 구성하면서 출력단으로 최대전력 전송을 위한 임피던스 매칭용 가변커패시터와, 상기 가변커패시터를 거쳐서 나온 신호를 직류전원으로 정류하는 정류회로와, 상기 정류회로를 거쳐서 나온 직류전원을 핸드폰, 리모콘, PMP, MP3 및 PDA 중에 어느 하나를 선택하여 충전용 접점에 맞도록 접속단자를 구성한 수신모듈을 구비한 소형ㆍ경량의 무선 전력 송수신장치. And a variable for receiving coil for receiving an electromagnetic wave induced magnetic field that occurred in the transmission pad and, connected to the receiving coil and the parallel impedance for maximum power transfer to the output stage and configured to receive the coil and the resonant circuit, the matching capacitor and the variable capacitor and via a rectifier circuit for rectifying the out signal to the direct-current power supply, a DC power source from, via the rectifier circuit to select any one of the cell phone, remote controller, PMP, MP3 and PDA a receiving module configured a connecting terminal to fit to the contact charging wireless power transmission system for a compact and lightweight provided. 상기 송신패드는 스파이럴 코일과, 전자파의 유도자기장을 중계하는 중계코일 및 상기 중계코일과 공진회로를 형성하기 위한 커패시터로 구성된 중계기와 상기 중계기와 유선으로 연결되지 않으면서 소정의 거리를 두고 설치된 스파이럴 코일과 결합한 구성과, 자성체 코어에 소정회수의 유도코일을 감은 솔레노이드 코일과, 하나의 자성체코어에 중계코일을 감고 중계코일과 공진회로를 형성하기 위한 커패시터로 이루어진 중계기와 상기 중계기와 유선으로 연결되지 않으면서 소정회수의 송신용 유도코일과 결합한 구성 중 어느 하나를 선택하여 구성한 소형ㆍ경량 의 무선 전력 송수신장치. The transmitting pads spiral coil without the spiral coil and a relay for relaying the induced magnetic field of the electromagnetic coil, and is not connected to the repeater and the repeater and the cable consisting of a capacitor to form in the relay coil and the resonance circuit is installed with a predetermined distance and combining structure and a solenoid coil wound around the induction coil of predetermined number of the magnetic core and, if closed the relay coil into a single magnetic core is not connected to the repeater and the repeater and a wire made of a capacitor to form a relay coil and a resonant circuit standing in the predetermined number of times the song selecting one of configuration in combination with a credit induction coil to the wireless power transmission and reception is configured compact and light weight apparatus. 상기 수신용 코일은 자성체 코어에 소정회수의 유도코일을 감은 솔레노이드코일과, 하나의 자성체코어에 소정회수의 수신코일과 상기 수신코일과 유선으로 연결되지 않으면서 전자파의 유도자기장을 강화하는 중계코일을 감고 중계코일과 공진회로를 형성하는 커패시터로 이루어진 중계기가 결합된 구성과, 스파이럴 코일과, 스파이럴코일과 상기 스파이럴코일과 유선으로 연결되지 않으면서 전자파의 유도자기장을 중계하는 중계코일과 상기 중계코일과 공진회로를 형성하는 커패시터로 구성된 중계기가 결합된 구성 중 어느 하나를 선택하여 구성한 소형ㆍ경량의 무선 전력 송수신장치. Wherein the receiving coil is a solenoid coil wound around the induction coil of predetermined number of the magnetic core, and the relay coil to strengthen the predetermined number of receiving coils and the induced magnetic field of the receiving coils and without being wired connection is electromagnetic waves of a single magnetic core close coupled the repeater composed of the capacitor to form the relay coil and the resonance circuit configured with the spiral coil, the spiral coil and the relay coil and the relay coil standing relaying induced magnetic field of the electromagnetic wave do not lead to the spiral coil and the wire and selecting any one of the repeater composed of the capacitor that forms a resonant circuit configured by combining the configured compact and lightweight wireless power transmission apparatus. 상기 정류회로 및 평활회로를 거쳐서 나온 직류전원을 전기에너지의 충전을 필요로 하는 전자기기의 충전용 접점에 맞는 접속단자를 구비한 소형ㆍ경량의 무선 전력 송수신장치. A wireless power transmission apparatus of the compact and light weight having a connection terminal for charging contact of the electronic device through a direct current power from the rectifier circuit and smoothing circuit requires a charge of electrical energy. 상기 수신모듈내부에는 충전용 배터리가 방전되어 작동되지 않을 경우에 사용할 수 있도록 충전용 배터리를 더 구비한 소형ㆍ경량의 무선 전력 송수신장치. The receiving module inside the wireless power transmission and reception system for a compact and lightweight further comprising a rechargeable battery for use in case not operate rechargeable batteries have been discharged. 상기 수신모듈은 핸드폰, 리모콘, PMP, MP3 및 PDA 중에 어느 하나를 선택하여 충전용 접점에 맞는 접속단자를 구비하고 외부기기와 체결되는 구성이나 핸드폰, 리모콘, PMP, MP3 및 PDA 중 어느 하나를 선택하여 내부에 내장시키는 구성으로 이루어진 소형ㆍ경량의 무선 전력 송수신장치. The receiving module, select a mobile phone, a remote control, PMP, MP3 and PDA either by selecting one of the configurations or mobile phone, remote control, PMP, MP3 and PDA is fastened to the external device having a connection terminal for contact charging the the compact and lightweight wireless power transmission device of a structure consisting of embedded therein.